Combine soup, dressing mix, garlic, and broth. Sprinkle chops with pepper (do not salt). 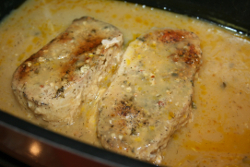 Place chops in slow cooker and pour soup mixture over top. Cover and cook on high 4 hours or low 6-7 hours. Serve over rice or hot potatoes. Stacy's Notes: First made February 2015, from a pin I had on Pinterest. For us, I just used 2 boneless pork chops but made the full measure of sauce, we like to have gravy for potatoes. Used my dry ranch seasoning mix I make, about 2-3 Tablespoons, and try to season the chops with more than just pepper (Mrs Dash, garlic powder, onion powder, jarred minced garlic, etc). I usually cook these in the West Bend on high (setting 4) for about 3-4 hours. They are literally falling apart by then.